Anouk is a pinafore that will grow with a baby. At first it is a dress and will gradually become a tunic. The side bands can always be lengthened when the baby's chest size is larger, so it could be worn over a shirt later. Anouk breaks away from all of the pink dresses your friend probably got when her baby was born, but is still feminine with red poppies growing out of the green grass. 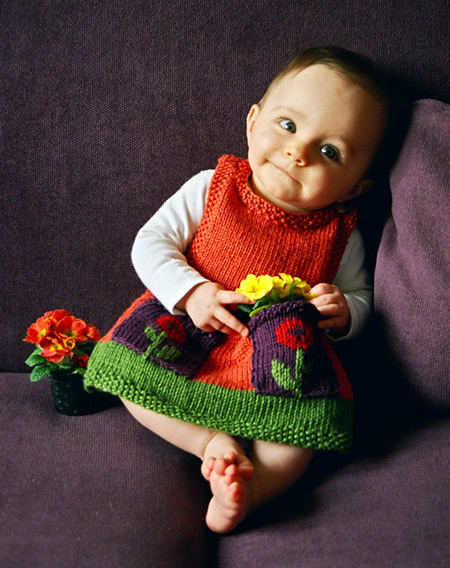 Knit the flowers in intarsia if you're up to it [piquant], or use duplicate stitch [tangy] if you prefer. With CC1 and straight needles, CO 69[71, 75, 79] sts. Rows 1-5: *K1, p1* repeat until 1 st remains, k last st.
Row 6: k1, p1, k1, p until 3 sts remain on left needle, k1, p1, k1. Row 7 (dec row): k1, p1, k1, p1, k1, ssk, k until 7 sts remain on left needle, k2tog, k1, p1, k1, p1, k1. (67[69, 73, 77] sts). Row 8: k1, p1, k1, p until 3 sts remain on left needle, k1, p1, k1. Row 9: k1, p1, k1, p1, k until 4 sts remain on left needle, p1, k1, p1, k1. 3 months: Work decs (as in row 7) in rows 11, 17, 23, 29, 35, 41. (55 sts). 6 months: Work decs (as in row 7) in rows 13, 19, 25, 33, 41, 49. (57 sts). 12 months: Work decs (as in row 7) in rows 13, 19, 25, 33, 41, 49. (61 sts). 18 months: Work decs (as in row 7) in rows 13, 21, 29, 37, 45, 53, 61, 69. (61 sts). Cont even in patt as established until work measures 11.5 inches from beg, ending with RS facing. Cont even in patt as established until work measures 13.25 inches from beg, ending with RS facing. Cont even in patt as established until work measures 15 inches from beg, ending with RS facing. Cont even in patt as established until work measures 17.5 inches from beg, ending with RS facing. Work 13[13, 15, 15] sts in patt, place these sts on a holder, BO 9, work to end in patt. Turn and work 1 row even. BO 3 sts at beg of next row. Work 1 row even. BO 2[2, 3, 3] sts at beg of next row. Work 1 row even. BO 2 sts at beg of next row. Work 1 row even. BO 1 st at beg of next row. Work 1 row even. Rejoin yarn and rep neck shaping for other side, reversing shaping. Next row (RS): K until 4 sts remain on left needle, work 4 sts in seed st.
Next row: Work 4 sts in seed st, p to neck. Next row: K until 4 sts remain on left needle, work 4 sts in seed st.
Next row (RS): Work 4 sts in seed st, k rem sts. Next row: P until 4 sts remain on left needle, work 4 sts in seed st.
Next row: Work 4 sts in seed st, k rem sts. Note: If you find knitting intarsia too difficult, knit the pocket all in CC2 and then add the flower using duplicate st.
Knit 1 pocket according to chart. Knit flower on second pocket as mirror image of first. Leave a long tail to sew on the pocket. You can choose tabs with one or two buttonholes. With CC2, CO 5 sts. Work even in seed st until tab measures 2 inches from beg. Work 4 rows even in patt. With RSs facing each other, bind the shoulders off together using a 3 needle BO and largest straight needles. With MC and circular needle, beg at back left shoulder, pick up 67[67, 71, 71] sts evenly around neck edge. Do not join. Work 4 rows even in seed stitch. Make sure you don't knit the buttonhole closed! With CC2, sew on pockets. Place them 2 or 3 sts in from the seed st edge, with the bottom touching but not covering the green. Make a duplicate st using the tail of the CC1 so the stem will connect to the "grass". With CC2, sew on side tabs. For all sizes, sew one tab on back on each side at top of skirt. On larger sizes, sew a second tab 2.5 inches higher. Sew buttons on front seed stitch edges. Sew button on left back shoulder. 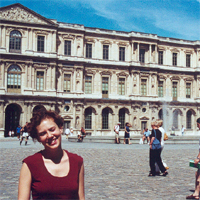 Kate Gilbert has been looking for fellow knitters in Paris, France for nearly 3 years. When she isn't knitting, she's a graphic designer and English teacher. Visit Kate's website at www.kategilbert.com. Pattern & images © 2004 Kate Gilbert. Contact Kate.